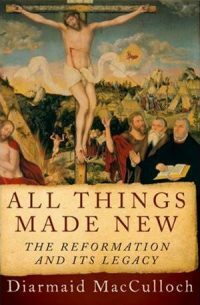 The Cathedral Book Club’s spring selection is All Things Made New: the Reformation and its Legacy, a substantial collection of 22 brilliant essays written by Prof. MacCulloch over the years, all dealing with the English Reformation, which is his specialty. It contains many useful insights and, for those of us in the field of Reformation studies generally, a number of very helpful references. The thesis that emerges from many of the articles is that the Church of England was part of the wider community of Reformed (although not necessarily Calvinist) churches until after the Civil War, when what we today we call Anglicanism was, for lack of a better term, invented. In several essays, he points out the rewriting of English church history by the nineteenth-century Tractarians, who wanted to argue that Anglicanism was always a “middle way.” Prof MacCulloch is himself a liberal Anglican, and he does not keep his views hidden. In part, this is helpful, because he has no personal attachment to either the Puritans or the Tractarians, and is therefore able to discuss the theological vagaries of the Church of England in the Reformation period without animus. On the other hand, his comments about contemporary religion–he wishes that Pope Francis might bring the Roman Catholic Church into conformity with modern ideas about sexuality–can be a bit annoying. Because they are largely irrelevant to the history he is discussing, the reader can ignore them with impunity. The Book Club discussed a previous book by MacCulloch, Christianity, the First Three Thousand Years, in 2014.